Long Trains (pictured left) is a game played with dice. The goal is to fill as many trains as possible until there are no trains left. Once you have ten cubes you can fill a train. However, if you roll a 5 you have to remove 5 cubes and put them back into the pot. 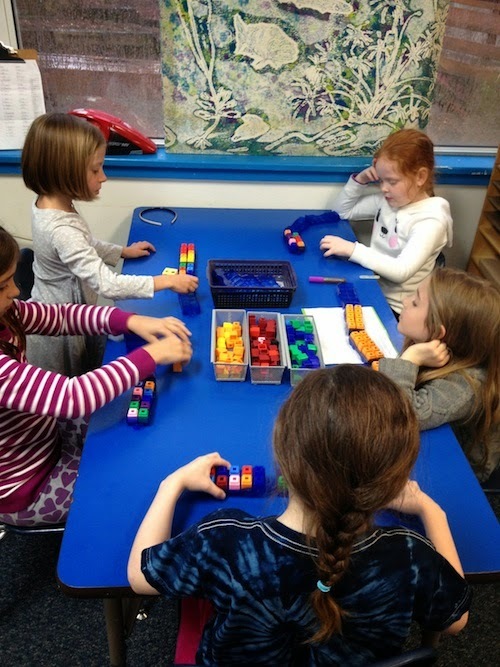 During this game time students are not only learning addition facts and mathematical strategies, but also how to take turns and communicate with one another appropriately. Students have fun solving the various tile card sets. Above you can see an example of a Subtract-A-Tile set. Students work hard to place all ten tiles in the correct place to make the various equations work. Sometimes this can take several attempts. 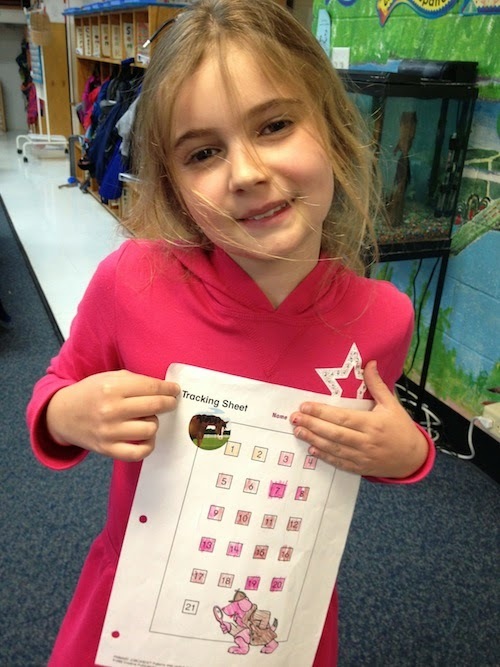 Students use hundred charts, number lines or other manipulatives to help them while they work. The tile card above is from the Add-A-Tile set. This set focuses solely on one-digit addition. Each tile set comprises of 20 cards. Above you can see an example of Borrow-A-Tile. These cards involve two-digit subtraction with regrouping. 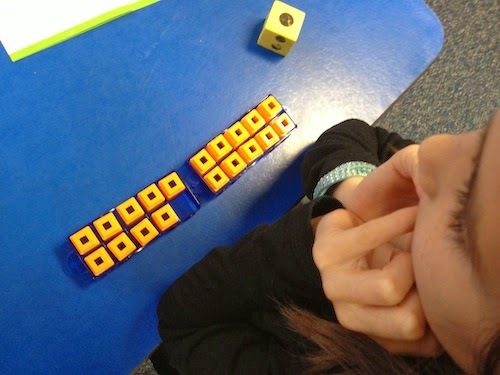 River students quickly learn strategies to help them tackle this kind of math. Once a student has completed a set of cards they receive a presentation. Well done! Math apps can be a lot of fun. Students are able to choose from apps such as Coin Math (as pictured above). They learn the names of coins and their values. They can even go shopping! Other helpful and educational apps include Jungle Time, Acorn Multiplication, SumStacker, and Math Ball. The ipad technology is used as a tool to help provide additional practice of specific topics. For example, after a teacher-led lesson on telling time students would spend a few minutes on the Jungle Time app to practice what they had learned. Chess is always a popular activity during math center time. There are a number of chess enthusiasts who are willing to help other students learn the rules of the game. Students often work in their math folders. 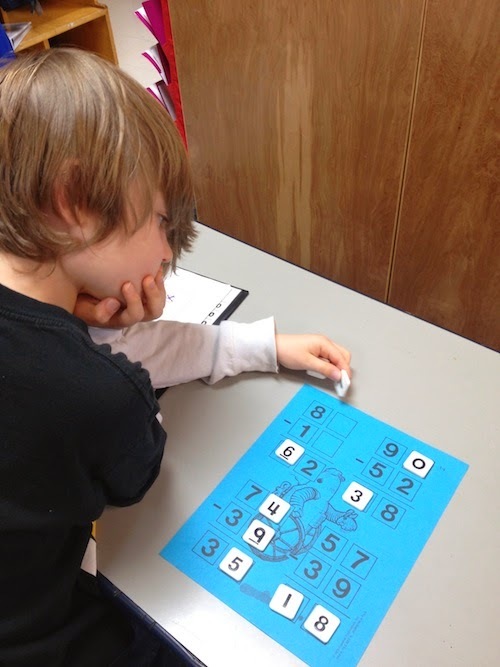 They complete a variety of exercises to help with their learning of both addition and subtraction facts. The student above is circling numbers to add up to a particular sum. The student pictured below is working out the word riddle by solving the math problems assigned to each letter.